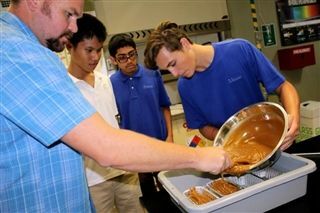 Students in Upper School Service Learning Group Alternative Energy Sources (AES) are giving new life to kitchen waste. Using a process known as saponification, simple oils (in this case, cocoa butter, coconut oil, and used rice bran oil donated by Veggie Grill restaurant) are melted and combined with a sodium hydroxide solution. The students also added a bit of fresh lavender and lavender oil to the mixture. The result is a chocolate lavender scented soap made from 70 percent used oil. AES will be selling the handmade soap at Fall Fest.